I have had a Flickr Pro account for quite a few years now. I have been a fan for a long time and have learned a lot from other photographers through the huge variety of groups in the network. However, I was reminded that I needed to update my subscription a couple of weeks ago and I paused briefly. The question that was going through my mind was “is Flickr still worth the effort”? The pro account is reasonably expensive every year and there are a fair number of other services which are free. Until the last couple of weeks there hadn’t really been many updates worth talking about for a while. I still bemoan the loss of Picnik. It’s replacement, Aviary, is just like a rather poor version of the Instagram filters. It is good, therefore, to see the update to the IOS app. It is designed for the iPhone so is only scaled up on an iPad. 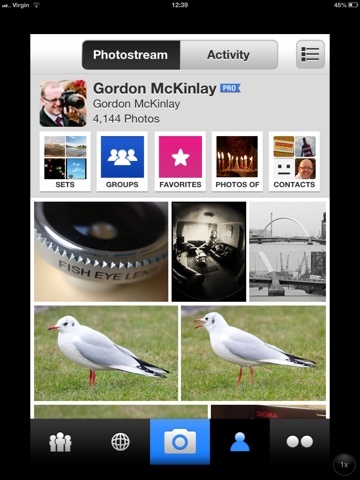 It is a huge improvement on the old version and makes it much easier than previously to view, upload and share images. Perhaps the timing of updating was deliberate as Instagram finds itself in trouble over changes to its terms and conditions. Although it is a lot better i don’t want Flickr to be another Instagram. They are for different things and serve different purposes. Most of the photos I upload to Flickr are high resolution, high quality images taken with a good quality DSLR. I only use my iPhone for quick snaps when I am out and about without my Nikon to hand. So I have paid my subscription for another year. I hope I will still be wanting to do so again this time next year. There are still many of us interested in more than Instagram can offer. This entry was posted in Professional and tagged aviary, Flickr, Instagram, iOS, iPhone, mobile, nikon, photography, Picnik on 22 December, 2012 by Gordon McKinlay.